Centurion TableTop Pro - ON SALE! - FREE Shipping! NEW – Wet and dry trimmer trims 2.5-3.5 lbs dry per hour. Replaces 6 human trimmers. The Centurion Tabletop Pro is the smallest most efficient tumble style trimmer in the world. This machines sits at a trim 24" in length X 10" width and 21" in height. Weighing only 35 lbs, this trimmer is the epitome of elegant engineering at its finest. Built for the connoisseur who admires the finer things in life, this machine was designed to be the most delicate machine on the market today. Don't be fooled by the size , the Tabletop Pro replaces over 6 human trimmers without sacrificing quality. This trimmer is currently being shipped World Wide to small growers who demand quality, durability, and privacy. 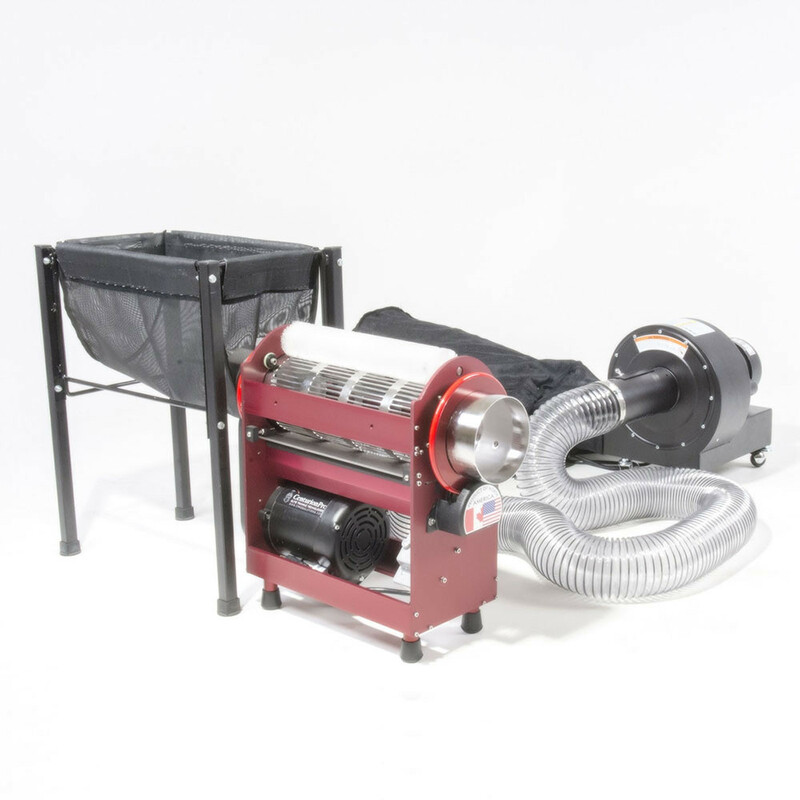 This machine works with both wet and dry flowers and will harvest 1.5-2.5 lbs dry (20 lbs wet) per hour of use. The Tabletop Pro runs completely off 120v power and comes with a strong 1hp leaf collector with 1800 CFM of suction power. Another quality of the Tabletop Pro is ease of keeping the blade clean, which is made out of D2 hardened steel. 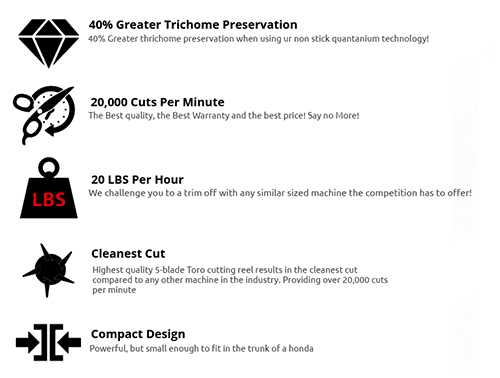 Unlike any other brand on the market, The Centurion Tabletop Pro employs a magnetic blade holding technology that allows for a five minute clean-up during operation, ensuring the machine has a consistently sharp, clean cut, and operates at a rapid pace. The Centurion brand is the only machines in the world that come inclusive with a non-stick QuanTanium Coated tumbler. The non-stick properties of the QuanTanium tumbler prevent previous trichomes from adhering to the tumbler surface. This results in the flowers having a better visual appearance while maintaining their strong natural aroma and flavours. Overall, you will notice a more potent flower as all natural properties are preserved during the harvesting process. The extra large hopper makes consistent feeding of the machine easier. Centurion machines are the only brand that uses a unique diverter to help fine tune the flow and cut on different strains giving the grower the ability to quickly adjust to different strains, or density of flowers. These diverters are how the machine can process dry flowers so delicately while still ensuring a tight clean cut and finish! A double bag system for trim collection aids in the ease of keeping the bags clean and helps save the trim for further extraction processes. 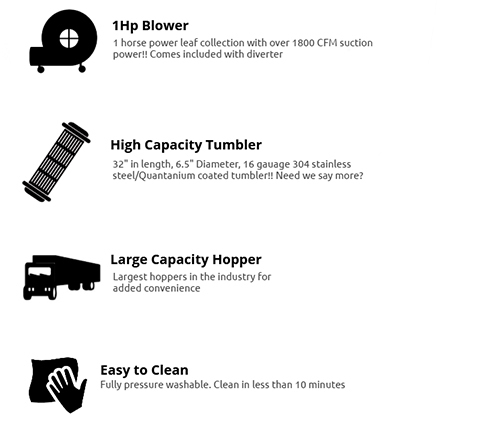 The Centurion Tabletop Pro comes with a 5 year warranty!! Great service ordered at the machine was literally at my door the next day and was free shipping awesome. Machine worked great would highly recommend to others.